(Milan, Dec. 7, 1962). 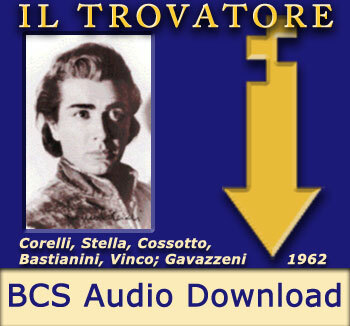 Corelli, Stella, Cossotto, Bastianini, Vinco; Gavazzeni; Chor. and Orch. of La Scala. CD version is on two CDs. “While there is no shortage of recordings of Il Trovatore available for purchase, and the opera is, despite the oft-lamented dearth of Verdi voices these days, still performed with regularity, this release is a significant document of a lost era. At the time of this performance, opening night of La Scala’s 1962-63 season, had one expressed the suspicion that in twenty years it would be impossible to assemble an Italian cast to do justice to Verdi’s masterpiece, it would have seemed laughable. And yet now, almost forty years hence, this exciting and vital presentation of a work which merely requires four sensational Verdi voices (a fifth, in the bass role, doesn’t hurt things), and an idiomatic conductor, seems as much a part of history as, say, the two Scala recordings of the late 20’s, one with Bianca Scacciati’s vivid Leonora, and the other with the searing Azucena of Irene Minghini-Cattaneo. The recorded sound, and the style of singing, may be more up to date here, but an opening at La Scala with an Italian cast and conductor, all able to handle the demands of a standard repertory Verdi opera, is so exotic today that it puts the 60’s more in line with the 20’s than with our time. “This performance is typical of the era as concerns cuts–Leonora loses the second verse of her Act I cabaletta, as well as the entire ‘Tu vedrai’ following the ‘Miserere.’ But despite these excisions, and the fact that most of the principals in the cast can be found on a DG Trovatore that originated in the studio at about the same time (Carlo Bergonzi is the Manrico on the commercial version), this is a set worth considering. First of all, there is the cast, captured here in the white heat of an opening night, with chemistry oozing from every…well, were it still the LP era, we might say ‘groove.’ The five protagonists are all young and in their prime. II Trovatore is a high energy opera, sometimes relegated to the position of static vehicle for static veterans. Here, there’s a sense of a viable love triangle, with the Di Luna as charismatic and attractive as the Manrico, and a Leonora of real femininity, balanced by sheer guts. “Franco Corelli was clearly the Manrico of his time, pliant yet heroic of voice, stunning to look at, and seemingly fearless in the upper register. ‘Deserto sulla terra,’ anything but an easy opener, is tossed off with spectacular ease. Squillo-drenched high notes are balanced with floated soft tones throughout the performance, and even if, in the 60’s, real men didn’t trill in ‘Ah! sì, ben mio,’ there are caressing tones aplenty in place of the missing embellishment. ‘Di quella pira,’ a legendary Corelli moment, brings back memories of his sensational Met Manricos of the time, with a simply endless high B natural at the climax. “Antonietta Stella, sometimes lost in the Tebaldi/Callas crossfire, gives a lesson in fine, unaffected Verdi singing. One can quibble with the slurred trills in ‘Di tale amor,’ or lament the fact that her early-career pianissimo had deserted her by the time she was thirty-three, replaced by a lovely, if less impressive, mezzo piano. But, as always, Stella’s crystal-clear diction and her total commitment to every moment make her Leonora more than the one-dimensional character one usually encounters. Ettore Bastianini’s voice was once described as ‘oily, juicy sound,’ by no less than Dimitri Hvorostovsky, an ardent admirer of the older baritone’s recordings This performance finds Bastianini, just diagnosed with the throat cancer that took his life at the tragically young age of forty-four, in electrifying form, his plush instrument poured out with fiery abandon. His Act IV duet with Stella is perhaps the high point of a performance full of high points. “Fiorenza Cossotto was on the way to her great Azucena years in 1962; there is plenty of voice, but the tone is a bit lacking in depth, and there is not yet much in the way of detail. Cossotto was never a subtle singer, but she grew into her roles quite effectively, and this is early days for what was to become, along with Amneris, her signature role. Nonetheless, there are plenty of sparks flying amidst multitudinous decibels. Cossotto’s husband, Ivo Vinco, is a smooth-voiced Ferrando, who does trill–perhaps not the most expressive singer in the world, but quite respectable, even in such exalted company. “The authentic ‘Italian-ness’ of this live performance from La Scala in 1962 makes you realize how un-Italianate most of our current Verdi and Puccini singers–and conductors–are. Despite a bit of roughness in ensemble work (and the orchestra), this group brings out all the meatiness and excitement in Verdi’s thrilling middle-period score. Meatiest, of course, is tenor Franco Corelli, then at his prime, who offers a full-throated, red-blooded, unsubtle Manrico, with his unique, dark, handsome low and mid-range and those amazing, bright-as-steel, secure high notes. He transposes ‘Di quella pira’ down a half tone, but in exchange for the high-C we get an endless, show-stopping high-B. He even does some tender singing in ‘Ah sì, ben mio’ and in the final act’s duet with Azucena. For a complete listing of titles with these singers, please use the search box in the header above.